Take a little more transit and eat a little less meat — two things you can do to reduce your environmental impact. 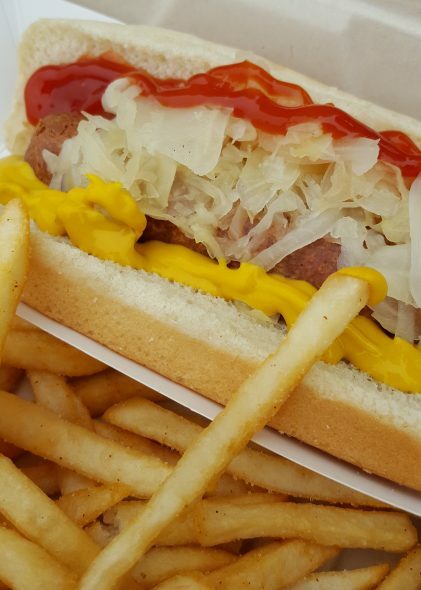 In this installment of Meatless Mondays with Metro we sample the vegan hotdogs at Earle’s on Crenshaw. Vegan hotdog with some fixings and fries. Always gotta have fries. Earle’s used to be Earlez Grille, one of South L.A.’s most prominent restaurants, before they had to close due to Crenshaw/LAX Line construction. It took a little time, but they were able to reopen in a new location about halfway between the current Expo/Crenshaw Station and the future Crenshaw/LAX Line Martin Luther King Jr. Station. While their new menu has been pared down a little, they’re still serving the items they are best known for: hotdogs, burgers and chili. And best of all, Earle’s has vegan and/or veggie options for all three. I agree that there’s really no true substitute for a ‘good old American beef dog’ — if that’s a flavor you really enjoy. But, as I’ve said before, I’m not in the business of peddling a 100 percent meat-free diet. I just like having a meat-free option. And I will also say the vegan hotdog at Earle’s is pretty darn good, so I don’t think you’d be disappointed if you tried it. To get to Earle’s, take Metro Bus 210 or DASH Crenshaw to Crenshaw/39th. If you don’t mind a little exercise, you could take the Expo Line to Expo/Crenshaw Station and walk south on Crenshaw for about 15 minutes. Two vegetarian chili dogs, fries, and playas punch every time. That playas punch. So good when it’s hot out. Suggestion: Orean Health express. It is a vegetarian ‘fast food’ drive-thru. It is on Lake north of Orange Grove in Pasadena near a Metro bike station. It is within 1 block of at least 15 other restaurants (6 of them major chain drive-thrus). I’ve been meaning to visit that place for a long time, so I’m glad Metro Bike will give me an excuse to finally go!